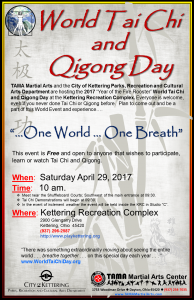 Under the guidance of Master Manuel Taningco 65th generation disciple of the “Tien Shan Pai” system ( Owner and Head instructor at TAMA Martial Arts ) and the unmeasurable generosity of the Kettering Park and Recreation department and their staff ( Jim Engelhardt and Nancy Boss ) TAMA will be hosting the 2017 World Tai Chi and Qigong day at the Kettering Recreation Complex in Kettering Ohio on Saturday April 29th, 2017. This year’s event is shaping up to be bigger than any previous year. World Tai Chi and Qigong Day was founded by Bill Douglas and his wife, Angela Wong Douglas, over 17 years ago in Kansas. They had dreams of spreading this Ancient Chinese way of healing and peace with the world. And now there are WTCQD events scheduled to be held in over 80 countries around the world. This year the Douglas’ will be in Tunisia giving demonstrations and leading the local group in WTCQD. This world event starts at 10 am local time in Australia, spreads around the world resulting in 24 hours of Tai Chi and Qigong. We will begin our day with big “Thank You” to the volunteers and instructors. Followed by a brief overview of what is “World Tai Chi and Qigong Day”. Then our talented instructors will demonstrate several empty hand forms and various weapons that we teach. We will also through in some applications to show that Tai Chi is not just pretty to watch but it can be used for self-defense. During the demonstrations spectators are welcome to visit our table and pick up additional information about local Tai Chi and Qigong classes. We will even have a signup sheet if you wish to receive additional information via email. When all of the demonstrations are complete we will start the Qigong breathing and stretching exercises. We will give the participant some easy tools/techniques to reduce the stress in their daily lives. We may even share some of our student’s success stories, anonymously of course. After everyone is warmed up and feeling good, we will separate the participants into several groups. One group will be for those that are just starting their journey, while other groups will be comprised of varying experience levels. We will then walk through the Tai Chi Form and movements to their conclusion. Once we have concluded all of the forms and routines we will close the event with additional Qigong exercises that will send the spectators out into the world with warm and pleasant feelings. At this time our instructors will be available for questions and answers. Ancient “Big Frame” Yang Style. Learning to walk again for beginners.